The link John and Mary gives much of the information we have about James to date. 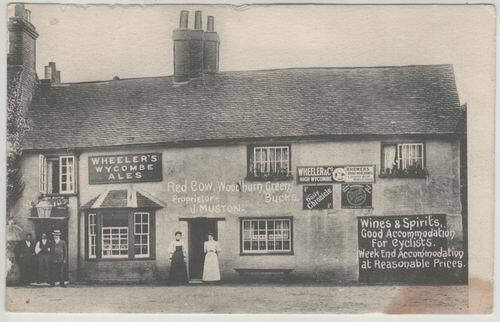 James ran the Red Cow Inn in Wooburn Bucks, and also listed his “country address” as “Tilgate Forest Lodge”. See note below. Also refer to Locations / Maps and the tree. Below are photos of James and other items of interest. 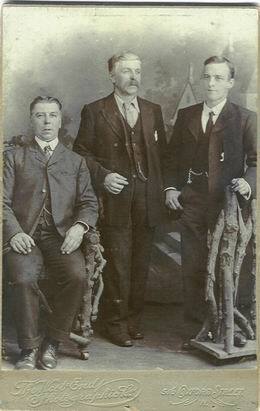 This photo is of Joseph (left) and his son George (right). The man in the middle we assume is James. 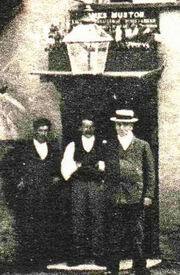 Taken before Josephs death in 1906. Did James have a family ?? James does not appear in the 1881 census so details are sketchy. We know he was married to Martha Fox. 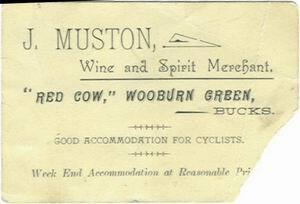 Gareth Challis of the UK sent this information in search of a James Muston. The years fit and so does the location. Walter's father is listed as James MUSTON. The only Walter I can find on the 1881 census in that area has a father called Chas. 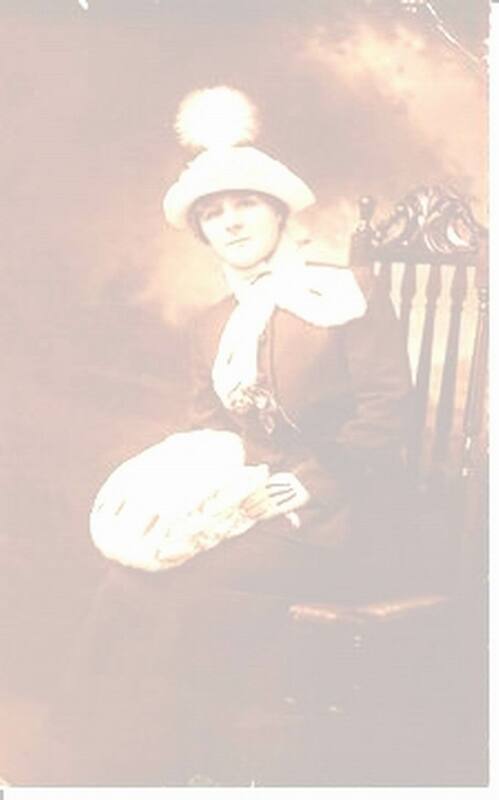 There are no other Walter's on the 1881 census in any area that were born within 4 years either side of 1872! 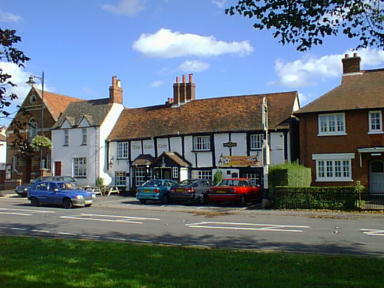 The Red Cow Inn. 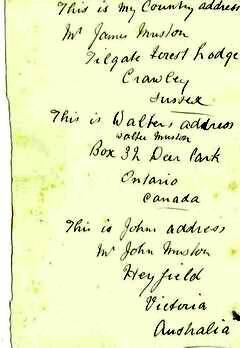 This photo was in the possession of John Mustons great granddaughter in Australia, and lines up with the list and card below now in the USA in Josephs Gt Grand-daughters possession. At left is a zoomed in image if the 3 men in the foorway at left. You can read James Muston above the door. I think James is the man on the right. At right is the list of names found in Olwen Mustons belongings in Wales by her sister living in the USA. This list started the search for the connection of these families. This image was taken off the internet adverising a pub crawl in 1999. If you compare this to the above image you will see that they have added the Tudor style boards, an entry porch, and removed the door at left. James advertises “good accomodation for cyclists. This, and the attire in the photo can give us an idea of the year the photo of the Inn was taken and his business card was printed. “The Penny Farthing is also referred to as the 'High' or 'Ordinary' bicycle, and the first one was invented in 1871 by British engineer, James Starley. The Penny Farthing came after the development of the 'Hobbyhorse', and the French 'Velocipede' or 'Boneshaker', all versions of early bikes. However, the Penny Farthing was the first really efficient bicycle, consisting of a small rear wheel and large front wheel pivoting on a simple tubular frame with tires of rubber.” quote from Mary Bellis at About.com. From this we can assume that it took a few years for the bicycle to become a fashion so maybe mid 1880’s to about 1920 would be a rough guess. There is no mention of motor cars but the English were a little slow off the mark in that regard.